Leadership 6 Edition The most practical leadership textbook on the market, LEADERSHIP 6e uses a unique three-pronged approach to teach leadership concepts and theory. The authors combine traditional theory with cutting-edge leadership topics in a concise presentation packed with real-world examples. 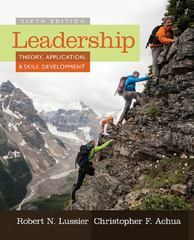 The text puts students in the leadership role, engaging them in applying the concepts and providing step-by-step behavior models for effectively handling leadership functions.